Agent Orange is a humanitarian concern we are doing something about. More than four decades after the Vietnam War, the United States and Vietnam are just beginning to address the negative consequences of Agent Orange, the dioxin-contaminated herbicide used during the war. In this groundbreaking book, two leading experts on Agent Orange and its aftermath explore current scientific understandings of the chemical and consider the promising solutions to addressing the consequences of its use. Authors Dr. Le Ke Son and Dr. Charles R. Bailey outline the moral reasoning for a fuller American response and present further steps the United States and Vietnam can each take in a joint humanitarian initiative to resolve the legacy of Agent Orange/dioxin in Vietnam. They address the critical issues of whether dioxin pollution still exists in Vietnam, what needs to be done to finish the job of cleanup, how many victims of Agent Orange carry out their lives today, and the impact of Agent Orange on relations between the United States and Vietnam. …From Enemies to Partners offers a way forward that acknowledges the past while looking to the future. 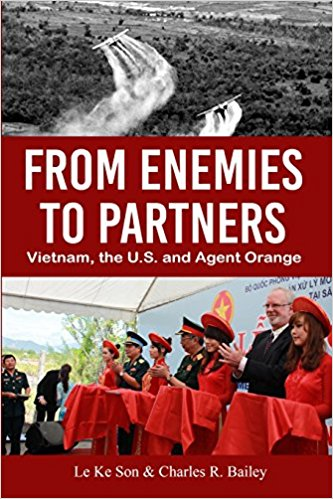 “From Enemies to Partners” co-author, Le Ke Son, is a medical doctor with a Ph.D. in toxicology and led the government of Vietnam’s efforts to find an equitable way forward on the Agent Orange legacy with the U.S. government. He first directed the Agent Orange Victims Fund at the Vietnam Red Cross and then moved to become the leader of the Office of the National Steering Committee for the Overcoming of the Consequences of Toxic Chemicals used by the USA in the War in Vietnam (known as Committee 33), and concurrently, vice director general of the Vietnam Environmental Administration and Vietnamese co-chair of the United States-Vietnam Joint Advisory Committee. In writing From Enemies to Partners Son and Bailey have drawn on their firsthand experiences with Agent Orange and its legacy accumulated over the last two decades. They also interviewed nearly 40 other Americans and Vietnamese to unearth their insights on what has happened and the way ahead. Son’s knowledge, credibility and access now enable him to conduct a thorough review of Agent Orange/dioxin issues in Vietnam. Bailey’s long engagement with Agent Orange/dioxin and his familiarity with the key players on the U.S. side enable him to explore the U.S. perspective fully. Visit http://aspen.us/journal/contributors/charles-bailey for more information. This entry was posted in Uncategorized and tagged author, Dr. Charles R. Bailey, enemies, enemy, Partners, partnerships, Today's Honoree, Vietnam War. Bookmark the permalink.